In our limitations as human beings we depend on time for our existence. Seconds turn into minutes, minutes open up to hours, hours step up to days and days pile up to a week and weeks give us a month and months proceed to a calendar year. There are no pauses; life keeps moving. People come in and out of existence; there are nights and days, the year begins (as new) and it later ends (as old). Change is generally constant. No doubt people are eagerly waiting for the birth of a new year and there is normally a great feeling of enthusiasm connected with the coming year. With this disposition people formulate positive oracles in anticipation of better times. It is not uncommon to hear such things as: “This is my year of double honours, this is my year of divine elevation, and this is my year of abundance!” And so on. These are formulations that are done with deep positive mental attitude. Indeed nobody would like to paint the New Year with negative colours. I do not contend the importance of such utterances like the ones we have above; even as a form of emotional analgesic for the coming year. My worry is actually directed at to us the “heir apparent” of these promises. The central question is: “with what disposition are we expected to receive these potential new realities in our lives in the New Year?” Put in another way: “Do we expect New Realities without a NEW US?” In the synoptic gospels our Lord Jesus Christ did instruct that new wine ought to be put in new wine skins (Matthew 9: 14-17, Mark 2: 18-22; Luke 5:33-39). This actually means that the new realities we desire in our lives in the New Year should be received with new lives. Often we pray and ask God to change situations for us but we don’t want to change. We want God to step up and speed up things for us, but we want to remain where we are and what we used to be as those changes occur. This negligence of inner transformation has been the bane of our growth and development in so many areas of our lives. How would someone expect divine elevation when he or she does not have time for prayers, Masses and the sacraments? How can one receive divine abundance in the New Year when the individual does not know what charity is all about not to talk about practicing it? How could someone anticipate double honours from God when he or she has no time to honour things of God? We line up some “wonderful” plans for ourselves with the view of living out our lives in the New Year but we end up worse that we were in the previous year. Why? The simple reason is that our plans were merely rational; there was no deep inner conviction and readiness. We can only receive as much as we have given. This same negligence of inner transformation has been destructive of our polity. For instance in Nigeria my country we have had and we are still generating programmes that are focused on social change: “War Against indiscipline, Structural Adjustment Programme, War Against Corruption, Rebranding Nigeria and a whole lot of others. Some of these programmes succeeded only at the conceptual level without producing functional fruits. This is largely because internally generative transformation was lacking; new wine were poured into old wineskins. Do not remember the former things, nor consider the things of old.Behold, I will do a new thing, now it shall spring forth; shall you not know it? I will even make a road in the wilderness and rivers in the desert.(Is. 43:18-19). The point here is that we are often saturated with the past that the new realities find it hard to be admitted into our lives; like pouring water into a cup that is already filled with water. Our anticipation of better things and greener grounds in the New Year should necessarily be made possible by our disconnection with our unproductive past. It is actually the NEW US that will make the NEW YEAR plausible for us. Some people will be making resolutions for the New Year. But the question that arises immediately is: “how many of us will keep to our resolutions. Concerning New Year resolutions, two dispositions are evident. A resolution can be made either from the head or from the heart. The one that is made from the head is the one that is entirely rational. It is like calculating how many litres of water that can fill a drum and being inexact at the end of the day. Rational resolutions will end up rationalized. The resolution that comes from the heart is the one that touches one’s inner being. It is the kind that is transformative, the kind that seeks the face of God in all things. God stands as the author and finisher of all that concerns us. In God our New Year is blessed and doors are opened for us. God’s plan for us is benevolent and not malevolent (see Jer.29:11). But there is a precondition for God’s blessings and it is obedience to God’s words (Deut. 28:2-13). Obedience here entails dropping the past and all its pump and promises, it involves removing the old garment and going for the new garment that will attract and sustain new realities in our lives. It involves discarding the old wineskins and bringing in new ones for the sake of the new wine we are awaiting in the New Year. Forgive those who wronged you and ask for forgiveness from those you wronged. Be at peace with God and your neighbours. Make a list of the things you want to achieve this New Year and follow them up consistently one at a time. Make prayer a way of life and not an option. Remember that to kneel is to win. Look before you leap. Check well before you act or talk. Make Charity a way of life it pleases God a lot. Remember that what you sow is what you will reap. Sow good seeds! Take care of your health it is a gateway to wealth. Exercise often and watch what you eat. Check the commodities you have in your house for their expiry dates as some may have outlived their times. Do not be careless with your life or that of another person. Life is precious. The way you end and begin a New Year will determine how the year will run for you. Begin with God he is the ideal beginning and he will grant you a glorious sail through the year and a happy ending. 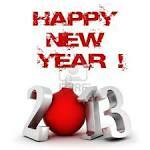 Have a wonderful New Year 2013…. May God tighten blessing for you.